i know that this is the exact opposite of everything our parents beat into our heads growing up. 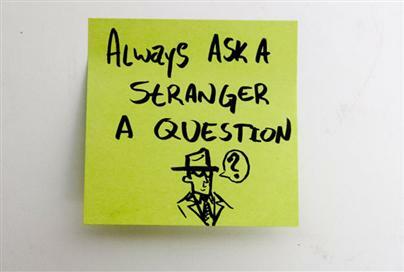 but to me, talking to strangers is one of the most valuable and interesting interactions one can have. perhaps this ‘stranger’ will someday become your next bunco partner or your doctor? a conversation with a stranger could result in learning about a different culture or religion, finding an apartment, gaining a recipe, improving your vocabulary, 5 minutes of belly laughter, a best friend, a lover, a long lost relative, or a business partner. i encourage you to ask people their names if you see them at least 3 times per week. your mailman, your doorman, the man in your elevator, bank line, your tailor, or the librarian. ask them where they’re from, what they like, and how they got where they are. take an interest in other people, and they will likely take an interest in you. everyone has a story to tell, it’s only a matter of sticking around long enough to hear it.